Managing traffic at major events or during the construction of major venues is of great importance in order to ensure efficient road and public transport. The safety of visitors and pedestrians is another important aspect that needs to be taken into consideration. PTV Transport Consult helps develop transport, security and safety concepts for major events, trade fairs and public buildings such as railway stations. In Dortmund, the Signal-Iduna-Park often hosts football matches with more than 80,000 visitors. The Westfalenhalle Dortmund, the largest trade fair venue in North Rhine-Westphalia with its modern congress centre and over 1,000 regional and national conferences and congresses per year, is located directly next to the Signal-Iduna-Park. Not only individual events, but often also parallel events, which take place at these two locations, lead to temporary restrictions affecting the entire road network. Therefore, PTV Transport Consult was commissioned to update the transport concept for Signal-Iduna-Park and Westfalenhallen. The first step was to thoroughly analyse and assess the current situation: In addition to a comprehensive camera-based traffic survey, PTV’s transport experts analysed the traffic to and from the venues as well as public transport and pedestrian flows. A weaknesses analysis was prepared on the basis of the quantitative analysis and the qualitative observations. The identification of weaknesses referred to traffic flow and performance as well as to road safety and organisational aspects. Based on the analysis, measures were developed at various levels and a working paper for the traffic and parking concept was updated. 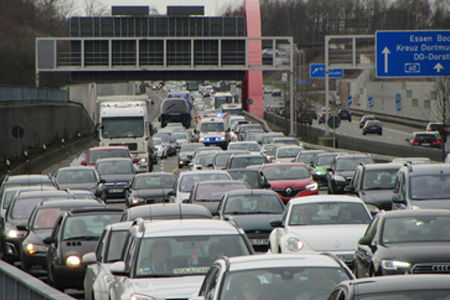 PTV Vissim software for microscopic traffic flow simulations was used to examine the measures developed for the aspects, that were considered particularly critical by BVB, Westfalenhallen and PTV. The results were then presented to various decision-making bodies.